One of Middle Tennessee’s leading commercial real estate firms, Horrell Company specializes in real estate brokerage services in leasing and sales, tenant representation, property management, development consulting, and acquisitions for commercial and investment properties in Nashville and throughout the Middle Tennessee market. With 60 years of experience, Horrell Company has built a trusted reputation with its family-owned and operated legacy, core values, and quality service. 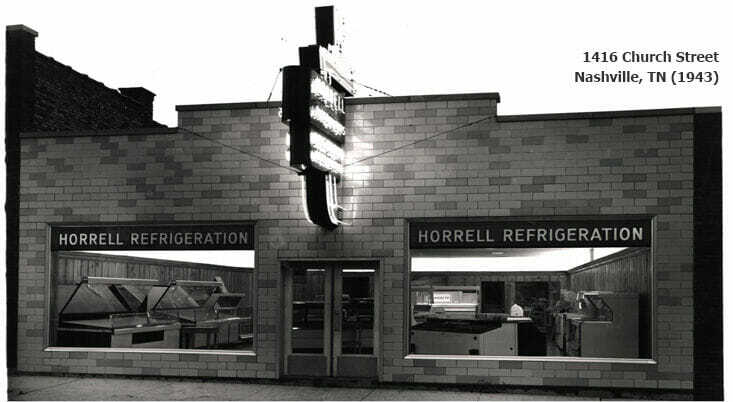 Horrell Company’s founder, Thomas Henry Horrell, started Horrell Refrigeration in 1943, providing refrigeration to local grocery stores. Horrell Properties, Inc. was later formed in 1946 and became a flourishing business that gradually evolved into site consultation and development services to grocers. With the purchase of a Sidco Drive and Thompson Lane property in 1955, Horrell Properties, Inc. expanded the business to include commercial real estate, including real estate development, brokerage, and management. Henry and his sons, Fred and Steve, sold the refrigeration business in 1972 to devote full-time to real estate development, brokerage services, and property management under the name, Horrell Realty and Investments. The company became Horrell Company in 2005 and is the brokerage arm of the Horrell family business. Horrell Company is now led by Steve Horrell as its president and co-brokers, Laura Grider, Ben McKnight, and Mike Russell. Steve, Laura, Ben, and Mike, represent over 100 combined years of experience in Middle Tennessee Commercial Real Estate Sales and Leasing. “I believe what makes Horrell Company unique is that we’re a boutique operation in an ocean of national companies,” says Steve Horrell. “Because of our longevity, we have a real place in the commercial real estate business that includes around 400 tenants from office to retail to industrial to warehousing,” he adds. As for what makes the relationship with Maxwell Roofing & Sheet Metal, Inc. so good, Steve says it is their attention to detail and their execution of processes. “With Maxwell Roofing, you can always get someone on the phone, and their follow-up time is second to none.” Steve explains that the biggest potential issue in the world of commercial property management (aside of mechanical issues) are roofs. “Since Horrell Company is a part of the MAXCare program, the Maxwell Roofing team does an annual update for us, which is extremely helpful because we have partners who want to see the latest roofing surveys. MAXCare sets Maxwell Roofing & Sheet Metal, Inc. apart from their competitors,” affirms Steve. For other businesses considering Maxwell Roofing & Sheet Metal Inc.’s services, Steve encourages exploring what the Maxwell team has to offer. He explains, “When you’re a property manager, and a roofing issue appears, accessibility matters.” A perfect example of that for Steve was when Horrell Company had a roofing issue to arise on a Sunday. He emailed the Maxwell team with pictures and assuming to hear back on Monday. However, it came as no surprise to Steve when Maxwell’s Service Account Manager, Kalen Canady, emailed him back the same day. “That’s the kind of difference in Maxwell Roofing & Sheet Metal, Inc.’s level of care that has helped them maintain their high-ranking reputation throughout Middle Tennessee,” says Steve, who looks forward to the continued partnership with the Maxwell team.